Sports Costs > How Much Does a Tennis Court Cost? The price of constructing a tennis court in your backyard or elsewhere depends on the type of surface applied during construction, where the court is being built, the complexity of the setup, if it’s going to be indoor or outdoors, the contractor and geographical location. Since each job will be unique, the prices will widely vary. The price of having a tennis court built, on average, can range anywhere from as little as $15,000 for a simple concrete court with no accessories to as much as $80,000+ for a customized court that needs more prep than other jobs. The price can be all over the place since there’s so much involved. The court’s materials, the accessories, additions, and extras can all affect the costs. According to QualityCourt Industries, the average cost to build a residential tennis court could cost $65,000 once you factor in the dirt work, post tension slab, fencing, lighting, surfacing and all of the accessories. Fast-Dry Courts, Inc., a tennis contractor, claims the cost of building a tennis court can cost anywhere from $28,000 to $80,000 if you lived in Florida. The company states there are so many factors that can affect the cost of a tennis court such as the site preparation, the court type, the amenities, and maintenance equipment you need. All tennis courts will not be created equally and won’t be made from similar materials. The most common surfaces found with home tennis courts often include grass, clay, asphalt or post-tensions concrete courts. Basically, you have the choice of either a soft or hard course surface. Grass surfaces, while an option for home use, can be popular with professionals; however, most avoid this surface since it can be hard to maintain. Clay surfaces, on the other hand, are also recommended by professionals and is known for its packed, crushed brick look, offering a slick appearance. While clay can reduce the speed of play, it can result in fewer injuries. Clay courts are commonly found in the southern states in the United States. Asphalt tennis courts, which tend to be the most common option, will be the cheapest option, but unlike most surfaces, it will have to resurfaced every 15 to 20 years or so due to cracking or sinking in hotter climates. Lastly, post-tensioned concrete refers to a process where the steel cables are tightened after the cement has been poured. This, in turn, adds more “power” to the court. Depending on the type of concrete surface you choose, the most important and one of the most expensive parts will be excavating the actual tennis site. This will include clearing the land of any landscaping and continuing with the grading once all shrubs, trees and plants are removed. 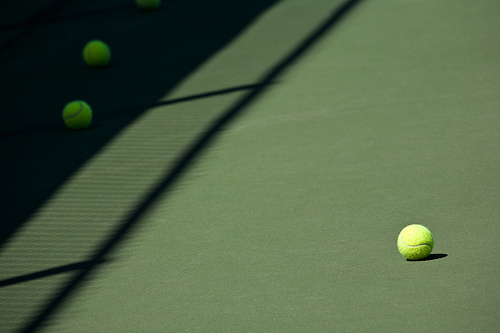 A tennis court, as you can imagine, will need to be 100 percent flat to properly play. This means there should be no slopes in the area of the court. To create this level court, gravel or crushed stone, often laid about six inches thick, will be brought in to stabilize the asphalt or concrete once poured. Lastly, a compactor will be brought in to level the surface. The average time to build a court, according to some of the contractors we researched, could take 60 to 90 days, weather permitting. Once the area has been cleared and excavated, the court is then ready to be built. During this process, it will depend on the materials you choose to build your tennis court with. If using concrete, cables will be used to create the size of the court, followed by installing steel forms and fence posts around the perimeter. The concrete is then poured, the cables are tightened to create tension and the concrete will finally cure. Asphalt courts, on the other hand, will be similar; however, no cable tensioning will be required. Both asphalt and concrete will need to be surfaced to keep it in peak condition. Grass courts will be as simple as adding sod and drawing the borders to create the court outline. With clay, there’s no pouring process, but it will have to be laser-compacted before it can be finalized. According to HomeAdvisor.com, clearing a swampy or rocky area can cost more due to the extra preparation work that’s involved. Additional costs, often not included in the estimates above, can include the lighting for the court, which may be needed for night games. Optional accessories such as water fountains, court organizers, built-in shoe cleaners, backboards, clocks, scoreboards and umpire chairs are all additional costs that may not be included in the estimate mentioned above. Additional features such as bleachers, a gate or fence around the court and additional nets can be an additional cost to consider. Maintenance tools such as the hand roller, drag broom, line sweeper, lute, line scrub, court rake and water remover all need to be considered to keep your court in tip top shape. These tools will greatly depend on the type of surface you plan on installing. Grass courts, just like a lawn, will need a regular mowing. Future maintenance costs need to be budgeted as well. For instance, according to this Patch.com article, you should be prepared to replace the new and center straps every three to five years. Every five to eight years, the cracks should be filled to prevent the court from becoming unplayable. Resurfacing, if needed, can cost $4,000 to $8,000, according to SportMaster Sport Surfaces. At a minimum, you will need at least 120 by 60 and 110 by 55 feet for proper construction. Don’t settle for the first contractor you see online. Instead, make sure you get at least three quotes because you’re going to find they all widely vary. If you don’t have the time or don’t know where to begin, consider using HomeAdvisor.com to get free multiple quotes from licensed and insured contractors in your area.